being the third of the great Seychelles beach triplets, Anse Cocos is accessible via Grand Anse and Petite Anse on La Digue. We have a description of the Anse Cocos Trail available for you and there will soon be a dedicated video of the trail. While it is not really difficult to get there, it is wise to know which path to take and it is even wiser to take enough water with you. There is no access to drinking water after you left Grand Anse. And at times the small kiosk at Grand Anse is closed too. 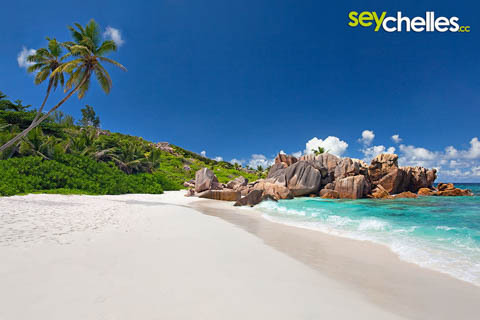 However, Anse Cocos for many Seychelles tourists is a dream come true. Lunate-shaped with white sand and beautiful waves. 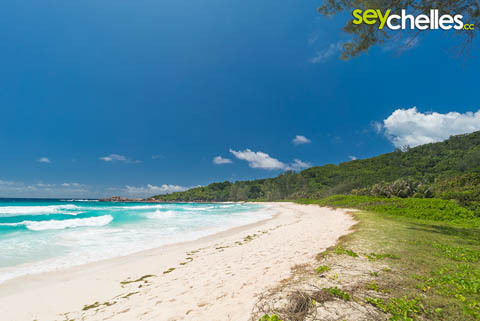 For us, it is one of the highlights of a Seychelles and La Digue vacation. You need to know that shadow is rare, and like all the beaches on this part of La Digues coast, it is not perfect for swimming. However, at the northern end of the bay, there is a small pool between the granite rocks that is perfect for having a bath. The area behind Anse Cocos gave the beach its name. 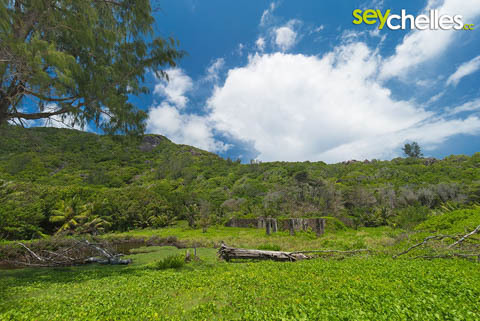 It is a former Coconut plantation and the ruins are still visible in the swamp.